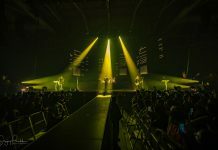 Colour Sound Experiment collaborated with lighting designer Miles Weaver as the lighting supplier for UK singer/ songwriter Nao, who has just completed the first UK and European leg of her “Saturn” tour following her second album last autumn. The tour was project managed for Colour Sound by Alex Ryan, who commented: “It’s the first time we’ve worked with Miles as a supplier and it was an excellent experience. His design was original and interesting, and it is always exciting to be involved with an LD and artist with a great future ahead”. Miles was keen to work with Colour Sound after being recommended by several other lighting designers. He took a floor package on the tour, stepping up to a full rig for the London showcase at Brixton Academy. For Brixton, it was a complete ‘own show’ scenario, but they had to step up seamlessly to over 4 times the size of a rig with no rehearsal or tech time! The Spiider count expanded to 36 for Brixton, with 18 of the additional 24 units rigged on two overhead V-shaped trusses – one slightly higher than the other – mirrored – footprint wise – on the floor with the original 12 plus another six making up the 18. A Showtex Ultralight stage net – in 4-metre-wide sections and covering the whole width of the upstage trusses – was stretched from the bottom of the lower truss to the floor, and attached to this ‘randomly’ was a set of 33 Saturnesque scenic domes made by Hangman. The domes were constructed from lightweight plastic, clipped to the netting and took light beautifully. Miles has worked with Nao since her professional career kicked off around three years ago, so keeping her very powerful and compelling performance centre stage is always paramount, and he is constantly conscious that lighting should never be distracting. He explained that she loves colour and nuance and has a personality that lends itself to vibrancy, something he likes to reflect in the lighting treatment. Nao also has some favourite visual effects, like the colour amber, and she’s inspired by many different elements which she discusses with Miles on an ongoing basis, some of which he will work into the show’s lighting. The nets are invisible during the show, so the domes look like they are floating in the air creating an interplanetary vibe related to the ‘Saturn returns’ theme that pervades the album. The domes bring a three-dimensionality to space without the need for a more complex set in an essentially simple idea that has a big effect. A row of Robe CycFX 8s along the floor skimmed up the backdrop bringing it in and out of play. The main hard-edged fixtures were Robe BMFL Spots, with 16 on the downstage V truss – (the Spiiders were in the upstage one). 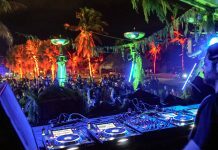 He’s used BMFLs a lot during festival seasons and likes the brightness and consistency of the output in addition to the colour mixing and the high CRI which ensures that artists always look great on camera! 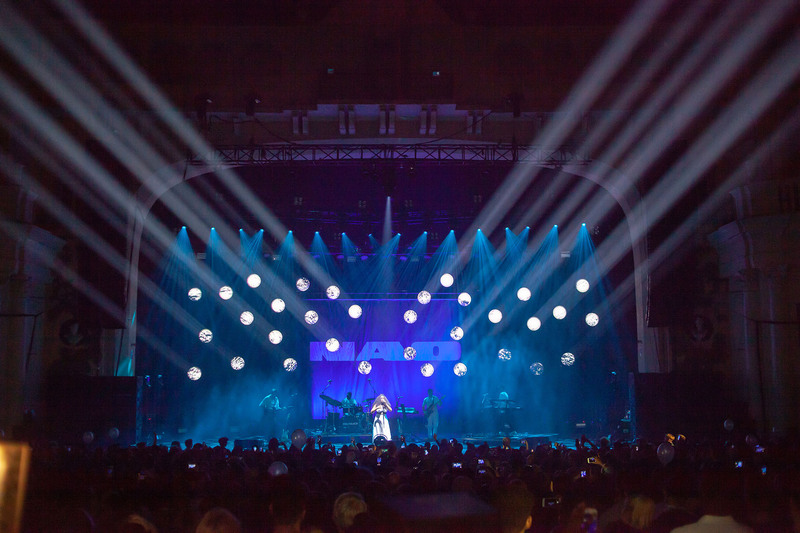 Robe’s LEDWash 300 on tank traps on the floor provided side lighting and created depth and cross washed over the 4-piece band as well as being handy for lighting the opening acts at Brixton. Miles also used a BMFL Spot as a follow spot, operated via a RoboSpot BaseStation, a recent investment by Colour Sound. 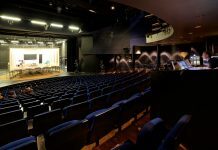 The BMFL was positioned downstage centre on the front truss and was Nao’s principal spot for the whole show, with the operator positioned stage right in the dimmer world. Miles loves the RoboSpot concept of being able to use similar fixtures to what’s in the main rig. He’d first used the system on a show for design company MIRRAD and knew it would work brilliantly for this show. Some Claypaky Stormy LED strobes were dotted around, some on the floor and some in the trusses, used judiciously for accents, bumps and pulses. Chauvet UV PARs worked in conjunction with UV clothing worn by Nao for a couple of numbers – four on the tour and six for Brixton. The UV glow highlighted the flow of her dance moves which popped while her face remained subtly lit in a spacey burlesque section of the performance. “It was a great experience working with Alex” Miles stated. “He focussed on finding all the practical and physical solutions leaving me to concentrate on the creative aspects – a perfect combination. The service is really outstanding, the kit is in first-rate condition and there is this great and very genuine family atmosphere there”. He also made the most of Colour Sound’s pre-vis suite ahead of the Brixton show, giving him a head start to an exceptionally busy and pressured day to deliver the high-profile London show. Miles tech’d the Spiiders on the European leg of the tour himself, and for Brixton, was joined by a fabulous Colour Sound crew of Sam Campbell, Dave Ward, Ross Burton and Simon Robertson.